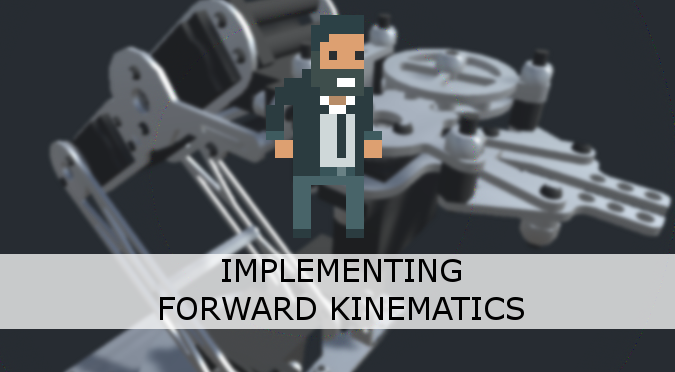 This tutorial continues our quest to solve the problem of forward kinematics. After exploring a mathematical solution in The Mathematics of Forward Kinematics, we will see how to translate it into C# for Unity. The next tutorial, An Introduction to Gradient Descent, will finally show the theoretical foundations to solve inverse kinematics. In the diagram, the various represents the Cartesian coordinates or the -th joint. The local angles that indicates how much they rotate from their resting positions are labelled . Knowing all of the above, we can start thinking of a possible way to implement these behaviours in Unity. Unity already comes with a way to implement all the requirements mentioned above: parenting. Setting a game object as child of another one automatically inherit the position, the rotation and the scale. If you are familiar with rigging, this should not surprise you. The bones that represent the joints of a humanoid character are parented in such a way that rotations and translations are inherited. 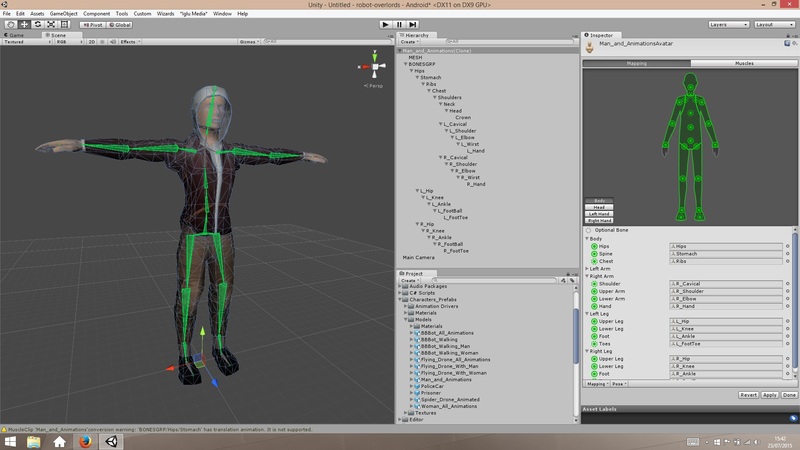 The following image, from Unity Animation 3: Character Setup (by Michael Arbuthnot) shows a clear example of this. While building your hierarchy of joints, you have to make sure that the robotic arm is in resting position when all the local Euler angles are set to zero. In a humanoid character, this usually corresponds to the standard T-stance seen in the picture above. The parenting option in Unity is, de-facto, solving the problem of forward kinematics for us. Unfortunately this is not enough. We will see in next part of this tutorial, Inverse Kinematics with Gradient Descent, that we actually need a way to test the position of the end effector without actually moving the robotic arm. This forces us to re-implement this basic feature in Unity. The first step is to store some information on each joint of the robotic arm. This can be done by adding a script, such as RobotJoint in the example below. To simplify the calculations, we assume that each joint can only rotate around one its local axes: either X, Y or Z. We indicate that with a variable called Axis, which has a 1 in the position relative to the rotation axis. If this joint rotates around the Y axis, Axis would be (0,1,0). We will see how this allows us to avoid IF statements. Let’s create a function, called ForwardKinematics. It takes as input an arrays of floats, called angles. The name is self-explanatory: angles[i] contains the local rotation for the i-th joint. The function returns the position of the end effector, in global coordinates. The code is a straight forward implementation in C# of the position equation seen before. The rotate functions is implemented with the handy Quaternion.AngleAxis. ❓ Need help with Quaternions? Rotations in Unity are often described with Euler angles. It’s tree numbers which correspond to the rotations of an object along the X, Y and Z axes. Euler angles represents the roll, pitch e yaw of an object in space. It’s not surprising that they are easy to understand. Mathematically speaking, however, using Euler angles can lead to some nasty problems. A better way to work with angles is by using quaternions. Quaternions are mathematical objects that can be used to represent rotations. Euler angles, conversely, represent orientations. A quaternion represents a way to go from an orientation to another one. Technically speaking, this is a massive oversimplification, but for the purpose of this tutorial is more than enough. A quaternion can be imagined as a rotation. Rotating an object in space is, mathematically speaking, equivalent to multiply its position by a quaternion. 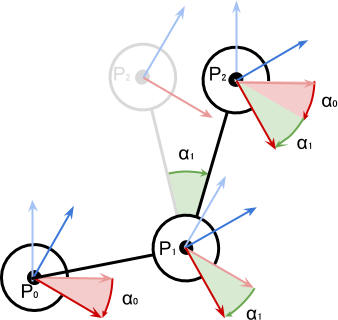 In Unity, you can use the function Quaternion.AngleAxis to create a rotation around a fixed point. The line Quaternion.AngleAxis(angle, axis); creates a quaternion that represents a rotation around the axis axis by angle degrees. In this context, the value of Axis can be (1,0,0), (0,1,0) or (0,0,1) to indicates the X, Y or Z axis respectively. This explains why we have created the Axis variable in the RobotJoint class. Multiplying two quaternions creates a new quaternion, which incorporates both rotations. During each iteration of the for loop, the variable rotation is multiplied by the current quaternion. This means that it incorporate the rotations for all the joints. 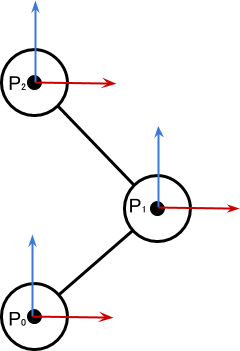 A multiplication between a quaternion and a vector applies the rotation. Credits for the 3D model of the robotic arm goes to Petr P. A big thanks also goes to Maurizio Scuiar. I may be wrong, but I think in this line local vector is added to global one. Missing conversion? Or am I missing something? I am having difficulty following this here. Does Forward Kinematics code go in your IKJoint class? Is the rotate code meant to be in its own function? Its kind of vague and it seems to me that the rotate code returns the position of the end point anyway? The IK code doesn’t perform any rotation. It calculates the position of the end effector, given a set of angles. I can use that to predict what the robotic arm is touching. Then, using Gradient Descent to find a solution. Could you please explain what Joints is? I inferred the RobotJoint class is supposed to have an array of RobotJoints, but it’s never written and as is the code will not compile. Hey! Have you tried downloading the package? Is there something that doesn’t compile? Can you please just put the Joints variable inside the example of the code you gave instead of giving incomplete tutorial code and requiring people to download your package to go through the tutorial? Is this how you thank someone sharing his knowledge for free ? I usually assign them by hand to make sure the order is correct. But yeah, that should work as well. Hey, Alan, great tutorial, I’ve been really interested in learning more about Inverse Kinematics and Procedural Animations and your tutorials have been my starting point. I just got a little confused on the code part, where is the ForwardKinematics () function supposed to go? Should it be in the RobotJoint class or somewhere else? And where does Joints [i] and angles come from? Thanks for the great work! Hi, Alan, in which class the ForwardKinematics () function should be located?